Settlement schools in the southern Appalachian Mountains at the start of the twentieth century nurtured elements of mountain culture they believed "native" and "pure." Their favored musical instrument was a quiet zither bearing the name dulcimer, Greek and Latin for "sweet tune" and alternately pronounced "delcimer," "delcimore," or "dulcimore." While a few dulcimers are straight-sided, most have curved sides, either single-bouted or double-bouted. In common usage, the single-bouted is called the "Virginia" shape and the double-bouted the "Cumberland" or "Kentucky" shape, terminology reflecting what is known about the locations of early makers. Both styles were made in North Carolina, but among the known makers in the state, the single bout was more common. 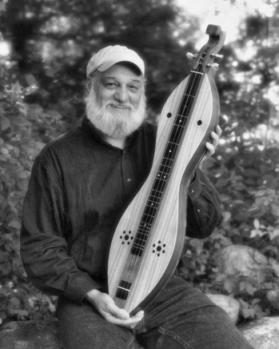 The dulcimer is played by pressing a noter, usually made of hardwood, cane, bone, or quill, against either a single string or two strings identically tuned, while strumming a rhythm pattern across all strings. The left hand holds the noter while the right hand strums, using either a flexible pick (quill, switch, or thin wood) or the fingers. This produces a melody accompanied by a harmonizing drone similar to that of the various small bagpipes used in all parts of the British Isles. Among the existing dulcimers made in North Carolina, the oldest is a single-bouted instrument made by William Thompson in Ashe County in the 1850s. A major variation of the single-bouted type was developed in the late nineteenth century in southwestern Virginia; known as the Galax dulcimer, it is similar to the single-bouted dulcimers made in nearby Surry County, N.C. The double-bouted, or hourglass, style influenced early dulcimer making in North Carolina when a dulcimer of that type entered Watauga County in the 1880s and served as the model for local craftsmen. L. Allen Smith, A Catalogue of Pre-Revival Appalachian Dulcimers (1983). Ralph Lee Smith, The Story of the Dulcimer (1986).